When we developed Hush Secure Forms, we put extra thought into making the building process smooth and simple. 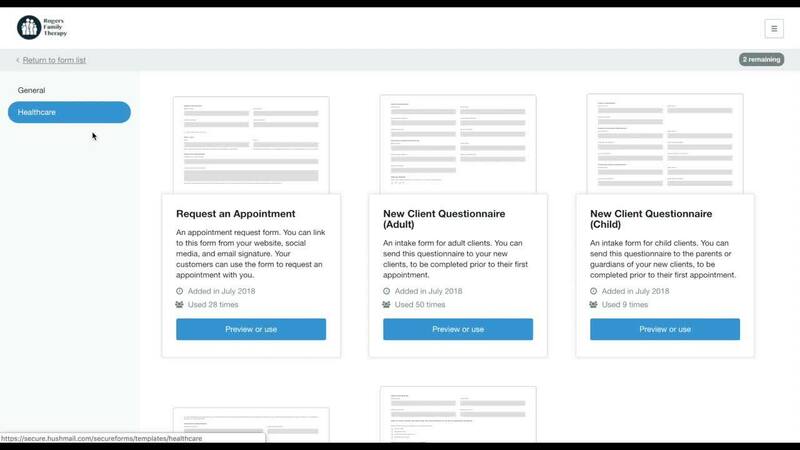 There are three basic ways you can build a form. The method depends on the time you have and how customized you want the form to be. 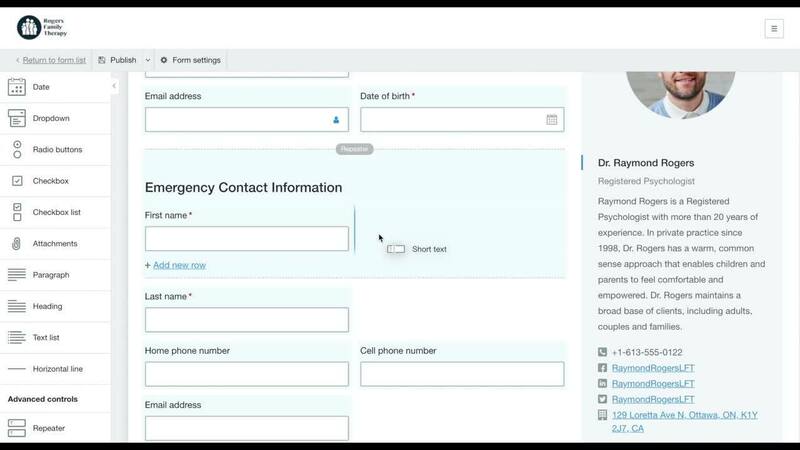 For full customization, you can create a form entirely from scratch. However, because you’re starting with a blank slate, you’ll have to put in the planning and content that makes an attractive, functional form. The easiest way to build your form is to use one of our templates in the template directory. All you have to do is add your information to the bio section, edit the contact information, and publish. The third method is a hybrid of the first two. If you don’t want to start completely from scratch but still want a customized form, you can build on one of our templates until it works for your purposes. That’s what we’re going to do today. In this post, we’re going to show you step by step how to create a HIPAA-compliant intake form for a therapy practice by using our New Client Questionnaire (Adult) template as a starting point. You can follow along as you read through the post. Let’s get started! First things first, sign in to your Hushmail account in webmail and find the menu icon in the top right corner. Choose Go to Hush Secure Forms from the drop down. This will take you to the page where you’ll create and manage your forms. Anyone who has a Hushmail account has access to Hush Secure Forms. If you don’t have an account, sign up for Hushmail Premium or Hushmail for Healthcare so you can start building customized forms today. 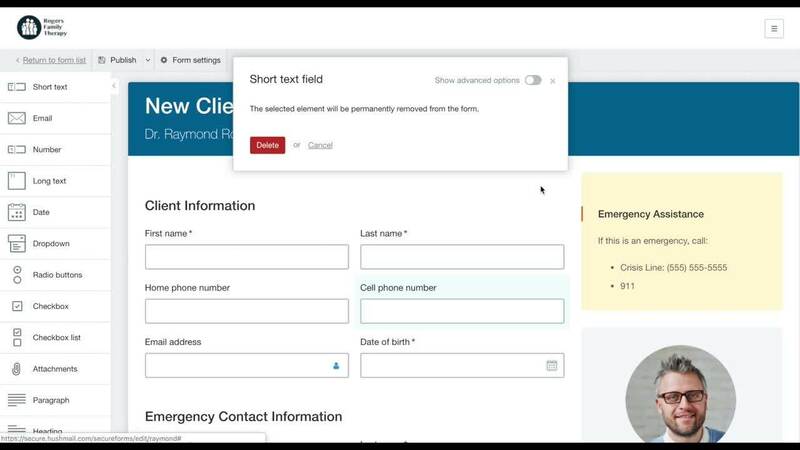 To create a customized intake form from a template, start by clicking on Create form at the top of the page. Next, you’ll have the option of choosing either General or Healthcare. For our purposes click on Healthcare. 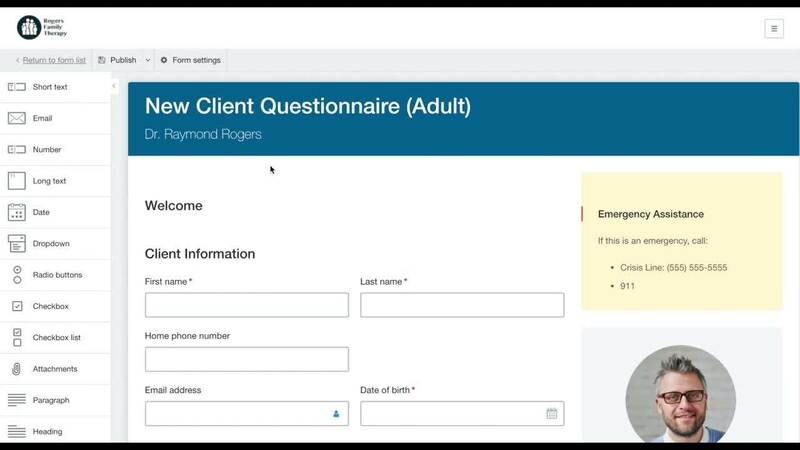 That will give you access to the New Client Questionnaire (Adult) template. Once you’ve chosen that template, click the Preview or use bar. On the next page, click Use this template, and you’re ready to start making your edits. 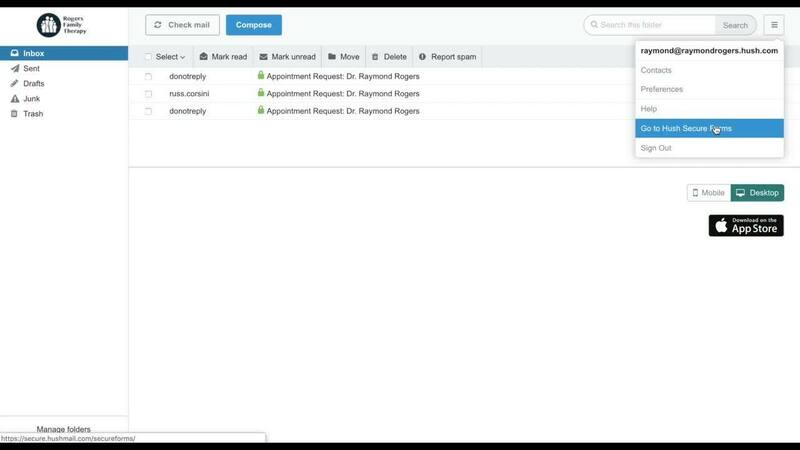 You’ll see that we’ve filled the template with sample content for a stand-in practitioner named Dr. Raymond Rogers. His name is at the top of the form as well as in the sidebar on the right. Take the time now to click on the areas you want to edit and replace the sample information with your own. Notice that you can choose Telephone, Work location, and Social network. Make sure you click on each of these to remove the sample content and replace it if you wish. Please note that there is an Emergency Assistance box directly above the bio. The default number 911 is listed as is a field for a Crisis Line, which is currently not filled in. Be sure to either delete the Crisis Line or fill it in with a working number. Read through the template carefully taking note of what you don’t need and information that you’d like to add. To delete an item, click on that part of the form and choose Delete. For our form, we’re going to remove the section asking about allergies to medications. Now you can include additional fields. As you look down the toolbar on the left, you’ll see there are numerous ways to collect the information you need. We’ll use a few of these in our form. Let’s start by adding a short welcome paragraph to the top. First, we need a heading for the paragraph. Find Heading in the toolbar and drag it to the top of the form. A blue line will indicate where the heading will appear. Then type Welcome into the Text field. Next, drag the Paragraph selection from the toolbar and drop it below the Heading. Type in the content of your choice. Click Apply when you’re finished making each change. Now, let’s say you want to find out about the symptoms your client has experienced in the last three months. Checkboxes work well for this, so select Checkbox list from the toolbar and drag it onto your form. 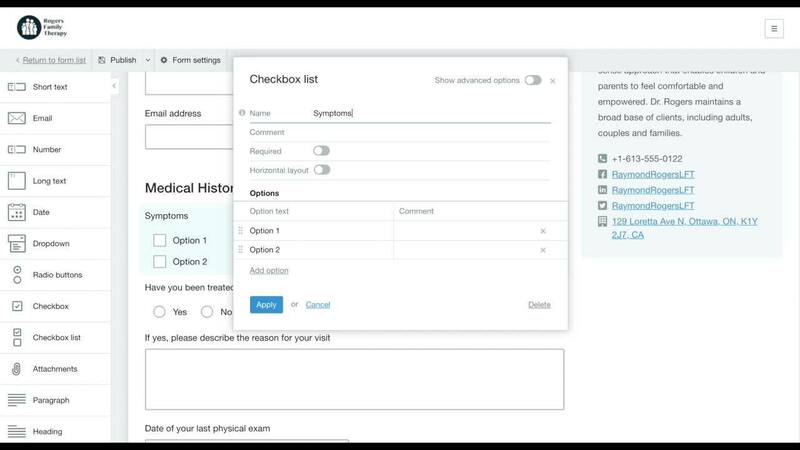 Once you've positioned the checkboxes where you want them (we placed ours at the bottom of Medical History), click on the new section and edit the content by adding multiple Options and including instructions in the Comment field. We’ll also select the Horizontal layout option. Again, click Apply when you’re finished. If you have trouble positioning the fields, make sure you’re paying attention to the location of the blue line. It will show you exactly where the field will show up on your form. The last thing to do is add content to the New row prompt. 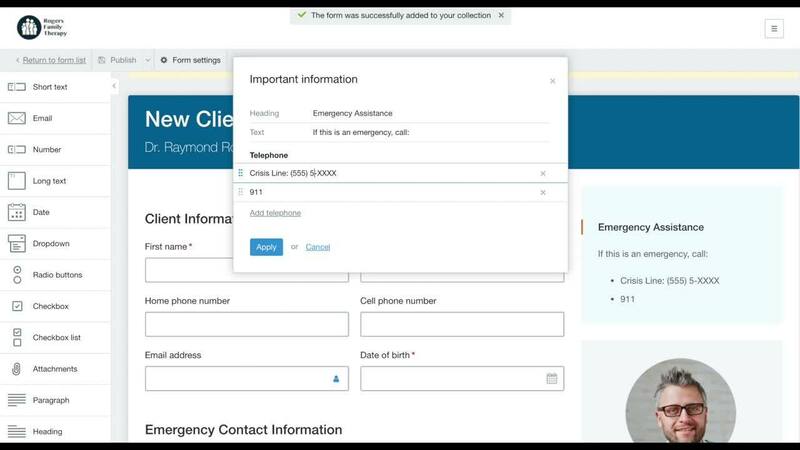 We typed in “Add another emergency contact.” You can also control how many emergency contacts your client can add by using Minimum and Maximum rows. We chose to limit the number of contacts to two. And there you have it. A brand new, customized client intake form developed from an existing template. Please take note of these essential style tips that will help ensure your form is attractive and easy to navigate. Don’t use ALL CAPS anywhere on your form, not even the headings. They come across as the typed equivalent of yelling. Be judicious when choosing to make fields Required. Some clients might feel uncomfortable providing certain information and stop filling out the form. Commonly required fields include name, contact information, and date of birth.